For eight years the Iowa Architectural Foundation has donated a tree to Blank Children’s Hospital’s Festival of Trees & Lights. The Festival is a five-day public event that is the main fundraiser for Blank Children’s Hospital. IAF’s former Executive Director, Kristen McHugh-Johnston, is the passionate donor, champion, designer and orchestrator who deserves our thanks for this charitable endeavor. This year, IAF was offered a vignette to decorate and transform into Santa’s Design Studio. The theme, “Santa’s Little Architects” was a perfect match for IAF: Santa’s elves were architects and designers who created toys delivered to the good boys and girls, especially those at Blank Children’s Hospital. Generous IAF volunteers contributed line work-drawings of iconic toys such as Etch A Sketch and a rocking horse. 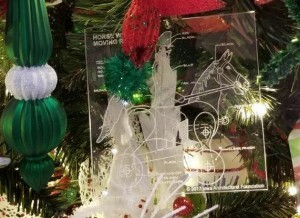 ASI Signage company laser etched the designs on clear acrylic for the ornaments. Mohawk contributed the use of 150 square feet of carpet for the vignette. Many volunteers helped get the vignette and tree decorated, and the toys assembled and displayed. Thank you to all for a job well done.